✔ Bag Dimensions: 15.3 x 13 inches. Good size and lightweight bag with drawstring closure is convenient and easy to carry. ✔ Bright color and clear doughnuts print, environmental friendly, colorfast, no bad smelling. ✔ Perfect gift for boys and girls who are sports fans, It's sure to be a hit sport equipment. They will surly love it! ✔ Nice and practical drawstring bag for school, sport, gym, and beach use, suitable for shopping, swimming, hiking, camping, running, cycling, walking, travelling, streetball, dance class, PE class, etc, great for carrying stuff for class or outdoors use, like basketball, gym or dance shoes. ✔ Nice, durable and easy to clean. 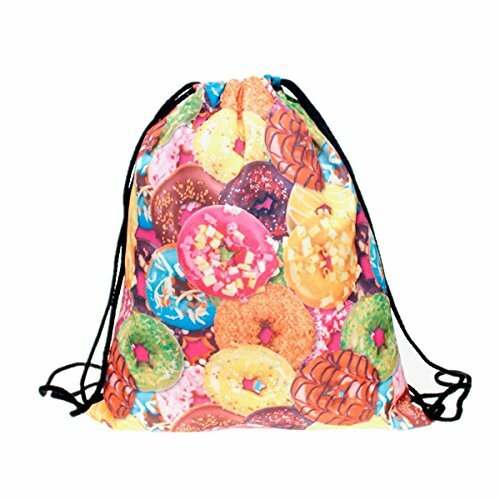 Package included: 1pcs doughnuts print drawstring bag. If you have any questions about this product by Zerowin, contact us by completing and submitting the form below. If you are looking for a specif part number, please include it with your message.